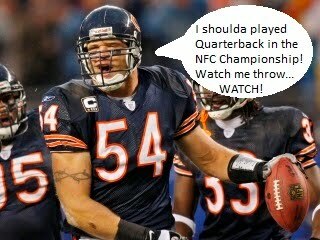 The Comedy News: Urlacher: "I Should Have Played QB In The NFC Championship"
Urlacher: "I Should Have Played QB In The NFC Championship"
CHICAGO, IL - (The Comedy News) - Following the Chicago Bears' 21-14 loss to the Green Bay Packers in the NFC Championship game, Bears linebacker Brian Urlacher suggested that he should have played quarterback for most of the game. "I'm definitely better than Jay [Cutler] is," proclaimed Urlacher. "I'm huge, bald, scary, and I can read defense. I'm older too. Five whole years older. That alone makes me a better quarterback than Cutler," argued the 7-time pro-bowler. The Bears' starting quarterback, Jay Cutler, left the NFC Championship game with an MCL sprain to his knee. His resilience of mind and ability to resist showing any signs of pain have lead many of his fans to believe that Cutler faked the injury to get out of being liable for the inevitable Bears loss. As a result, the Bears were forced to play their second and third-string quarterbacks, Todd Collins and Caleb Hanie, for the remainder of the game. The Bears' backup quarterbacks' lack of physical strength and knowledge of the game of football has lead their team mate, Urlacher to believe that he would have led the Bears to victory had he played quarterback in place of Cutler. "If [head coach] Lovie [Smith] put me in, first play, I would have done a flea-flicker---run fake and than bam, boom, bomb. Boohyah touchdown pass to Devin Hester. I would have also insisted that I kick the ensuing onside-kick. I've never done a kickoff before, but I have a lot of beginners luck," boasted Urlacher. Although Urlacher is not expected to play quarterback anytime soon, he will be a starting linebacker for the NFC in the Pro Bowl All-Star game this coming Sunday in Hawaii. During the 9-hour flight from O'Hare Airport to Honolulu, Urlacher plans on listening to his favorite songs from the Rudy soundtrack and some Metallica as he imagines what it would have been like to play quarterback for the Bears in the most important game they will ever lose.